Here’s some information on some tweaks I ended up doing to the ElliptiGo to make it more suited for my needs. In a future post I’ll talk more about how it is working out as an exercise/training tool. I found a good deal on a used 3 speed from Craigslist. Shortly thereafter, I took it out for its maiden (to me) voyage on the relatively flat Santa Ana River Trail. This first ride went well! I definitely got a lot of looks from others on the trail. The main downside was that I had a little trouble making it up the short steep rises where the bike trail goes under streets and then back up again. Based on my short experience on the river trail, I knew that the 3 speed wasn’t going to cut it in the hills where I live. So I bought the parts to upgrade it to 11 speed. 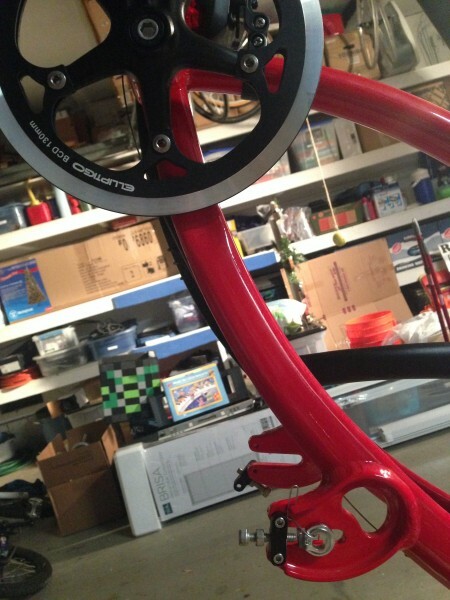 There’s no derailleurs on the ElliptiGo; all the shifting is done in the hub. The Sturmey-Archer 3 speed hub is similar to that from my old bicycles from the 1970s. Nowadays Shimano makes their Alfine internally geared hubs in 8 speed and 11 speed. 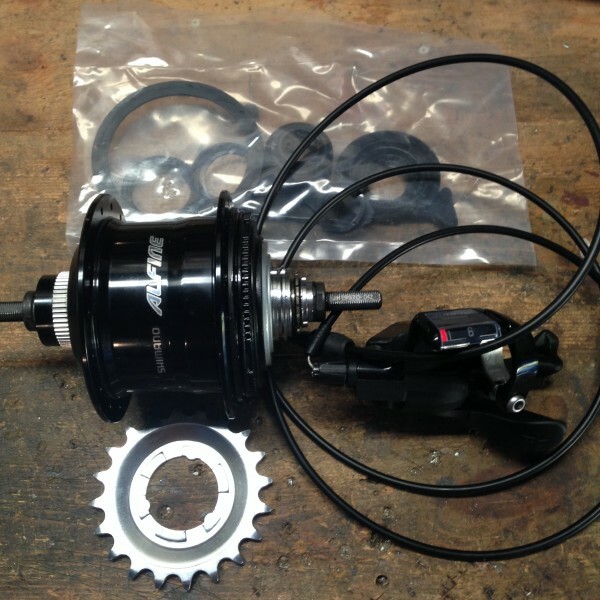 I got the great deal for the 11 speed hub and shifter online for only $385! (Though, in retrospect, that was not as good of a deal as it initially seemed, see the epilogue below.) Unfortunately, the hub normally doesn’t come with everything needed to install it on the bike. Luckily it came with a bag with most of the small parts. However, I still had to purchase the “small parts kit” in order to get the locknuts and the non-turn washers. I had to get the small parts kit for the 8 speed hub (not the 11 speed) in order to get the white and silver non-turn washers for horizontal dropouts. So I’ll be keeping the parts on the left, but tossing the parts on the right. I originally ordered the 20 tooth cog (sold separately) as shown a couple of photos above. Based on my bicycling experience, I would normally rather have my gears slightly lower than compared to the stock 11 speed setup with an 18 tooth cog. I figured that the ElliptiGo’s really long horizontal dropouts (about 4.5 cm) would pretty much allow me to use any cog with the 52 tooth chainring. But in reality, because the crankset is above rather than forward of the dropouts, those long dropouts only result in an “effective chainstay length” adjustment between 32.7 cm and 33.4 cm. I did some checking using the Fix Me Up! calculator, and while the 18 tooth cog would be near the middle of the dropouts, there would not be enough adjustment to make 20 tooth cog work with a 52 tooth chainring unless I went with a half link (I didn’t want to go there). Of course, changing the chainring is an option, but that was an added expense I did not want to consider at this time. At first, I decided to go with the standard 18 tooth cog. Although I expected that the wheel would be in the middle of the dropouts, the reality was that the wheel was all the way back. This put the brake pads near the bottom of the brake arms, making them tricky to adjust (but still do-able). 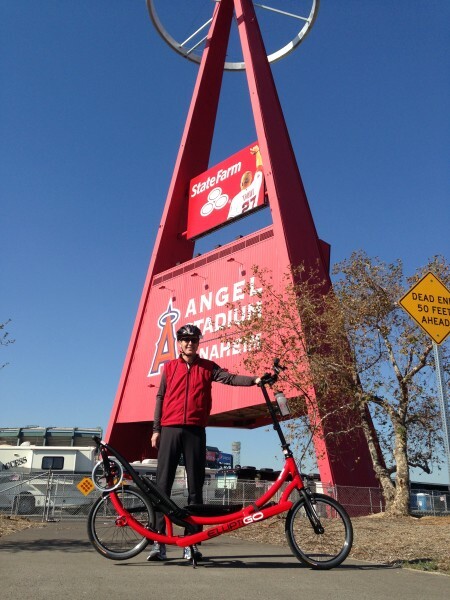 Furthermore, the lowest gear wasn’t quite low enough for climbing the steepest hills in my area (at the time – that has improved with more rides on the ElliptiGo), at least without my heart rate going through the roof. So I added an extra link in the chain and switched to a 21 tooth cog. Not only did this give a lower low gear without giving up too much on the high end (my high gear is now equivalent to that from a stock 8 speed ElliptiGo), it also allowed the wheel to be further forward in the dropouts, making brake adjustment much easier. In the end, the range of “effective chainstay lengths” is really only 32.9 cm to 33.4 cm. Assuming I keep the 52 tooth chainring, that only gives three possible cog choices (18, 21, and 22), as shown in the following table. Here’s a table of the various gearing options I considered (reported as gear inches). After a few months of experience and improved ElliptiGo fitness/experience, I found that low gear with the 21 tooth cog was much lower than I needed for the 6% grades in my area, and the high gear wasn’t high enough, requiring me to coast in situations where I could otherwise still safely pedal faster. So I switched back to the 18 tooth cog, giving a low gear that was still low enough, while actually having a high enough high gear to be able to pedal on the downhills. Unlike conventional bicycles which have brazeons for mounting water bottle cages and other accessories, ElliptiGo users are left to their own devices for carrying water, spare tubes, etc. 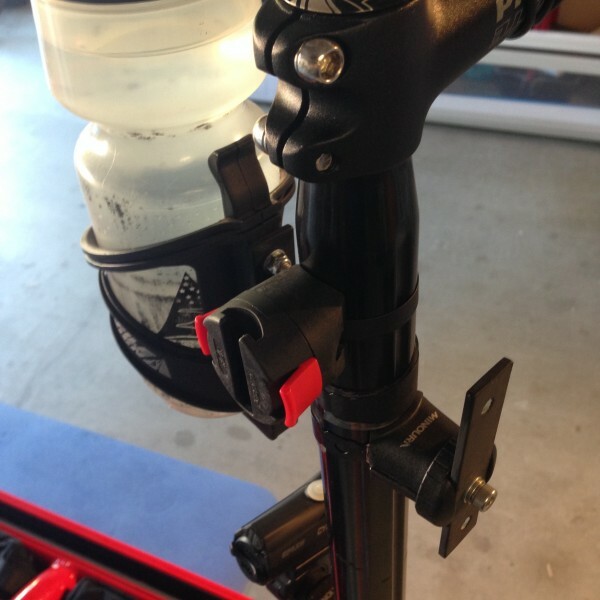 I had a couple of clamps from Minoura which would work for attaching a water bottle cage to the long steerer tube. Most people use the mounts with the quick releases, which look to be stronger than the metal band which wraps around the stem. But these mounts were already in my parts bin, so I thought I would try them first. On the ElliptiGo Facebook forum, I heard reports of breakage of the steel piece that holds the water bottle case. Such a failure here would be worse on this mount compared to the quick release mount, as the allen screw on this mount does the double duty of holding the steel piece and securing the mount. I replaced the standard steel band with some aluminum stock I had on hand, which gave a much more sturdy setup. 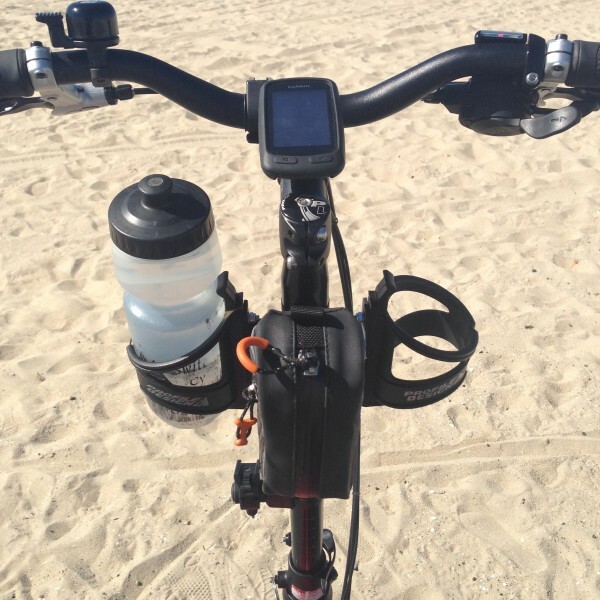 I added a mount for my Garmin, a small bag for my phone/keys, and a bell for the bike trail. I also added a couple of Stand Up and Ride bags which fit in the spaces between the tracks (I forgot to take a photo). One downside of the ElliptiGO is that it’s big and heavy, making it hard to transport. Originally, I could only get it to fit inside the minivan with one of the back seats removed, and still taking up a lot of space to boot. I then went searching through the garage and found my Hollywood Racks F4 Heavy Duty trunk rack. 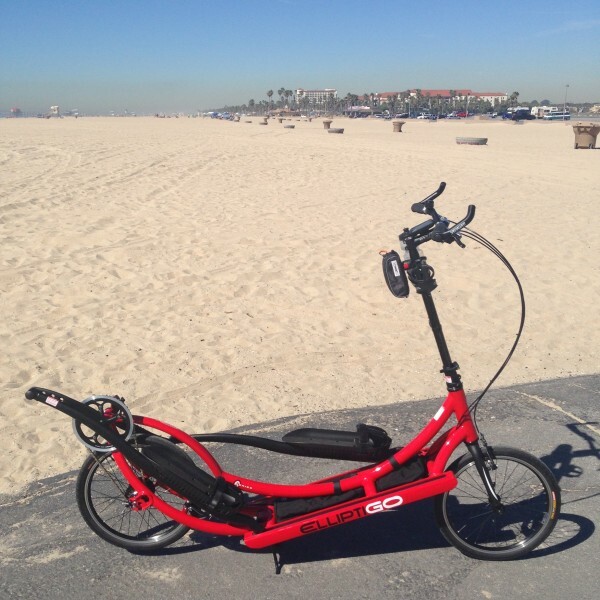 There’s no bike cradles on the support arms, making it possible to slide the ElliptiGo onto it. Though I didn’t like having to lift the ElliptiGo so high to get it on the rack! I then lowered the rack to the “sedan” position. That is too low to carry bikes on the minivan, as the tailpipe would be blowing on the wheels. But this position is perfect for the ElliptiGo. I asked Hollywood Racks for their opinion on this installation. 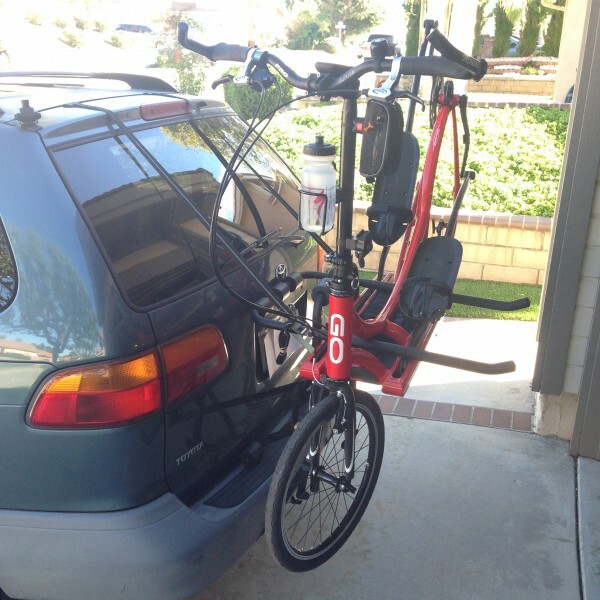 They recommend their Gordo rack for carrying the ElliptiGo, as the two arms are spaced 22″ apart for better weight distribution, rather than the 18.5″ for the F4. But I believe I should be able to get away with this setup for short trips. 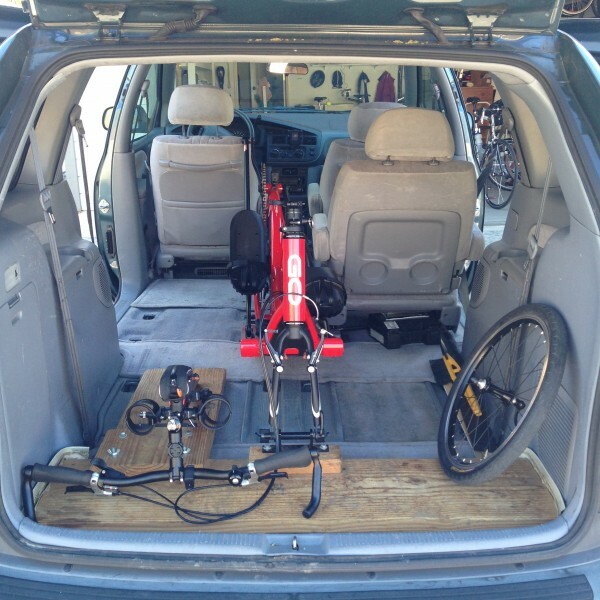 I found a better way to keep the ElliptiGo inside the van, using my homemade rack normally used for bicycles. The handlebar comes off to do this. I now have a trailer hitch on the van and using the Hollywood Racks 1450R hitch mount rack, as described in this post. I’ll write another post with observations and advantages/disadvantages of the ElliptiGo, after I get a few rides under my belt. After about 150 miles, I ran into problems with shifting into gears 10 and 11. After ruling out cable adjustment issues, I had a reputable shop take apart the hub to inspect it, and there was excessive wear in gears 10 and 11, much more than what would be expected for 150 miles of use. My understanding is that these hubs have generally been good, but there have been issues with some. 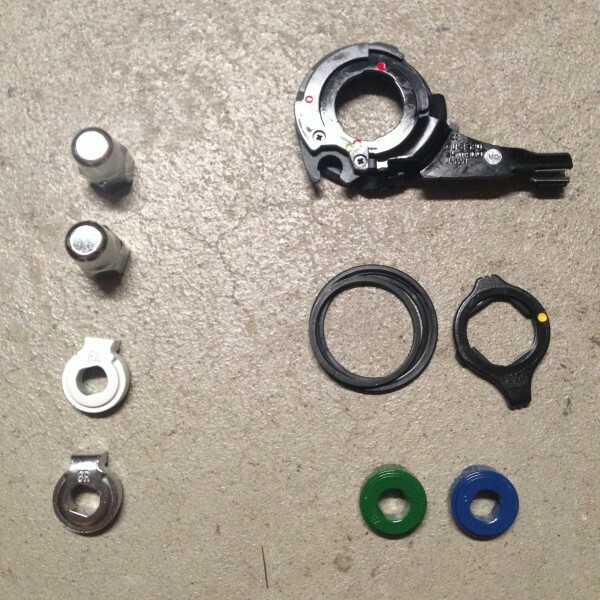 (Although to Shimano’s credit, I understand they have done a good job of replacing them under warranty.) Or I might have bought one that was advertised as new, but with the internals unscrupulously swapped out for damaged ones. Ultimately, without a proof of purchase from a legitimate supplier, I had to eat the cost for repairs. Lesson learned for buying parts for cheap parts online, especially in a situation you may need the manufacturer’s warranty. Is the fact that the ElliptiGo weights so much a hindrance to getting around with it? I mean if it is too heavy to easily lift in the car, it would seem that you are “pedaling” a lot of extra weight around. Maybe that’s just necessary due to the nature of the device? 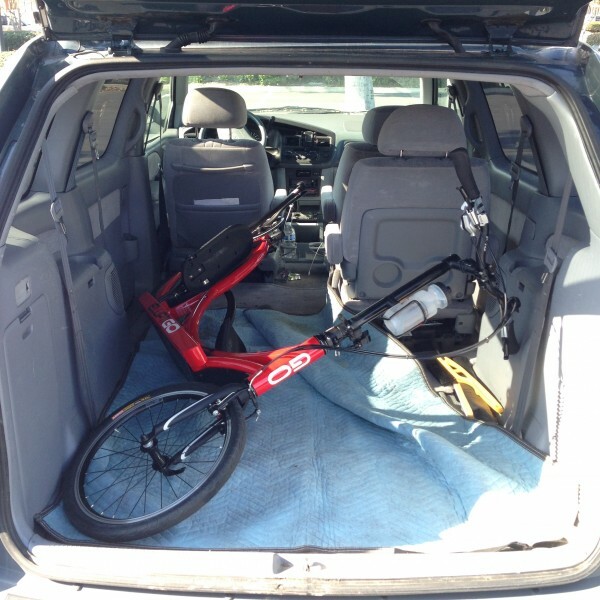 The worst thing about the 44 pound “Go” compared to a 25 pound bicycle is the lifting into the car. The weight is much less of an issue when pedaling, it’s still lighter than my fully loaded bike I rode across the US years ago. On the beach bike path where you see all sorts of human powered conveyances, the Go is still faster than everything except the light road bikes. 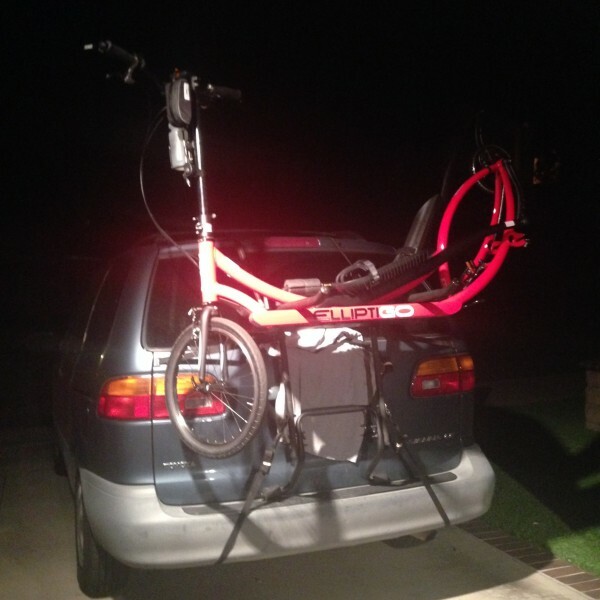 Ken – I am a 50 year old woman and I don’t have any problem lifting the ElliptiGO in and out of my car. I love my GO and any extra effort is worth it! Well, let me expand on my statement about the challenges of getting it in and out of the van. 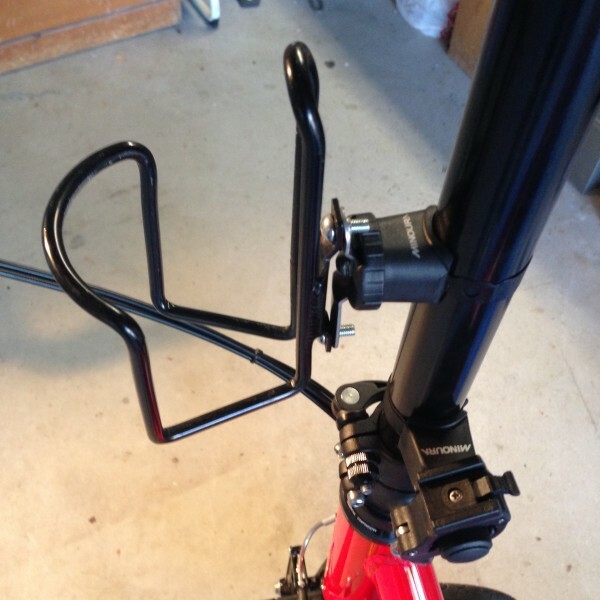 When I remove the handlebar/steerer, I put it on top of the pedals. Then I want to roll the whole thing backwards into the back of the van. The problem with that is that the pedals want to move whilst rolling, but the steerer is in the way. That gives me two choices: (1) roll the Go backwards into the van whilst holding the steerer, but that works best only if I have three hands, or (2) keep the steerer on top of the pedals and lift (instead of roll) the Go all the way inside, but it is hard getting the leverage to do so with the weight all the way in the back. Perhaps there is a better way to load it inside, but I haven’t figured it out yet. My question about the weight wasn’t focused on the ability to lift it. Obviously from the pictures, Brian was successful in getting it in the car. And on the car. The real question is that if is 19 pounds heavier than a lightweight bike, does that make you feel like you are working extra hard to pedal? Would it be better to ride if it were lighter? Even on flat ground additional weight can make pedaling a, umm, drag! I’ll talk about it more in a follow-up post, but if your point of reference is a lightweight road bike, then the Go is going to “feel” slow, especially on the hills. (By the way, on the flats and downhills, the non-aerodynamic standing up position seems to have more of an impact than the weight.) Yet those friends who have come from a running background tell me that the Go feels fast to them! This first time I rode the Go on a hill near me, it was a little demoralizing because I couldn’t stop looking down at my speed and noticed it was less than my typical bicycling speed on that hill. But then once I started using other performance metrics (heart rate) and stopped using bicycling speed as the yardstick, I was fine. Got it. So compared to a road bike, it’s less than ideal both due to additional weight and rider position. (Good point.) But for what it is and does, you like it. Thanks. Hi. Had an 8C for 3 years and just upgraded to an 11R. It’s a great workout and it’s solved my ongoing knee and back problems. Completely gone. I have been and always will be a cyclist. In a recent metric century, I had to deal with the frustration of getting passed over and over. It’s roughly 2x harder to travel on the GO and takes a lot more time. I can easily get mid 20’s on a bike with a tailwind. Same wind while on the GO and I might make 16. Still the GO has been a lot of fun. Getting into climbing the killer hills I’ve ridden on a bike. a 20% grade on a GO is an interesting experience! Brian, thanks for sharing this! I just got a used 8c (last week) and I’m liking it so far but was wondering if anyone upgraded parts instead of buying an 11R. Looks like you were successful! Anyways, I was thinking of trying the NuVinci 360 instead of the 11 Speed Shimano. Will do some research but it seems like an ideal setup for the Elliptigo. By using a similar cog and chainring it should fall about halfway between the 8 and 11 speed alfine. Did not realize choosing the cog and chain ring was this critical. So if I stick with the 53T that is standard on the 8C what choices would I have with cog size. The Nuvinci WOW, they 360 has morphed into the 380… shows a 16 – 22 cog range. Any feedback appreciated. @Coy – Congrats on the “new” GO! The NuVinci hub should work fine, but it looks like it doesn’t have as wide of a gear range as the Shimano Alfine 11. Even though the Alfine 11 has a wider gear range compared to the Alfine 8 (basically two lower gears and one higher gear than the 8), I still find myself wanting yet another high gear on occasion. So it is for that reason alone that I would recommend the Shimano Alfine 11. BTW, I have an extra rear Alfine 11 wheel (long story which I won’t get into here) that I’d be willing to sell if you’re interested. As for your other question, a quick check of the FixMeUp calculator, the 16, 17, 20, or 21 cogs would work with the 53T chainring. If you were willing to go with a half link in the chain, then that also makes the 18 or 19 possible. Hope this helps! Greetings, You have an interesting site and some interesting posts. I am working on getting my second hub for my 11R which I have had for 3 years now. I guess i am one of the lucky ones that had issues with the teeth. I am not mechanically savvy like you folks, so I am asking the question here. Is there another hub that will give the same range as the Afline 11 that I can have my shop swap out without having to too many additional parts? Any suggestions would be appreciated. Pete here, at Bicycles San Clemente. As you know, we just upgraded one of our customer’s 8C to an Alfine 11. The 11R comes stock with an 18T cog, but I put on a 20, ’cause he wanted an even lower gear, and never really cranks out in 11. The issue is 1.) very tight chain/ frame clearance, and 2.) reduced chain wear adjustment. ElliptiGos are engineered to the N’th degree and they left no room for modifications. Still, this mod has worked well for this particular customer who can now stroke up some steeps he previously had to walk. Elliptigo told me a Nuvinci would not mount correctly 2 years ago when I asked them why they didn’t offer it. I would love to have one and they were recently for sale for $200 complete. I’d do it in a minute. Anyone 100% sure it would work? 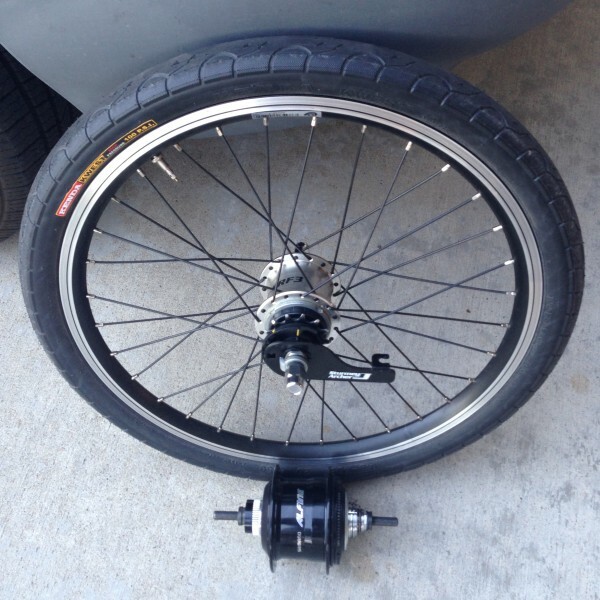 @Daryl – I had a bike shop reuse the old rim, and use new spokes to build a new wheel. The old spokes can’t be reused, because a different length is required for the different sized hub. Although I do most of the mechanical bike repairs myself, I’d saw the wheel building is definitely something to take to a bike shop, there’s definitely an art/skill to building wheels.